The new AVEdge 100 cable access enclosure from Extron Electronics is designed to mount onto the edge of a tabletop surface in semi-permanent installations without cutting the surface. "We recognized a need for AV connectivity in semi-permanent environments where installation must be quick and simple, and table surfaces could not be cut," said Casey Hall, vice president of sales and marketing at Extron. "The all-new AVEdge is a unique solution to this need that quickly and easily brings AV connectivity, data, and power to virtually any tabletop where convenient access is needed." An integrated clamp system secures the AVEdge 100 enclosure to a tabletop surface without the need for tools or additional parts. It accommodates two double-space architectural adapter plates (AAPs), cable pass-through brackets for up to eight AV cables, or three Retractor cable retraction modules. AAP power modules are available to provide USB and/or AC power for mobile devices and laptops. 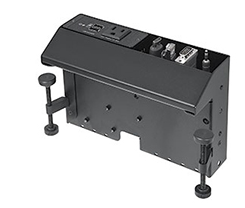 The optional CableCover is available to minimize cable tangles and accidental disconnects, and the Extron ZipClip Series is available to mount products, such as the PS Series Desktop Power Supply, directly to the enclosure. The AVEdge 100 is available in a black powder-coat finish.